Portable solution that supports ONT modules for 40/43G, Carrier Ethernet and Multichannel; designed for SVT groups at network manufacturers as well as service providers. Design, Conformance, and Verification Testing for Converged Transport and Datacom Environments in One Powerful Solution. The versatile ONT-503 allows to integrate all modules available for the ONT-5xx family. Its form-factor and the breadth of demanding test applications for e.g. 40/43G, Carrier Ethernet and Multichannel makes it the test set of choice for system verification groups and early deployers at Network Manufacturers’ as well as Providers’ companies. Broad selection of plug-in instrument modules for carrier Ethernet testing, SDH/SONET, PDH/DSn, OTN, EoS, Jitter. 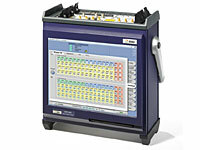 Portable jitter testing with industry leading accuracy compliant to ITU-T O.172 appendix 7 and 8. Preventing measurement gaps by analyzing 1000 channels in parallel of SDH/SONET and ASON systems. 40/43G – Supports verification of 40G SDH/SONET and 43G OTU-3 network elements. It includes evaluation of physical layer and conformance testing of the transport layer. High-accuracy Jitter/Wander – Allows for jitter and wander generation and high accuracy analysis of signals from 155 Mbps up to 10.7 Gbps. 10G LAN/WAN/OTN – Addresses the need of board and system testing of LAN and WAN systems and is mapped into OTN overclocked. OTN G.709 – Provides full functionality for system verification of 2.7, 10.7, and 43 Gbps equipment. OTN overclocked – Complete testing of a 10GigE client in OTN 11.05/11.1G and 10G FC Layer 1 in OTN 11.27/11.32G. MultiChannel SDH/SONET – Simultaneous testing of all 1000 channels of a 2.5 Gbps signal at STM-16/OC-48 or STM-64/OC-192 interfaces. Useful for CrossConnect testing with leaving no blind spots and turn-up testing for e.g. ASON. NewGen EoS – Allows for evaluation of SONET/SDH signals up to 10 Gbps, including virtual concatenation, LCAS emulation, GFP, and Ethernet MAC traffic. Ethernet – Enables generation and analysis of Ethernet traffic on electrical 10/100/1000M and optical GigE interfaces and allows for interworking with NewGen EoS. High coverage with 3-slot, multi-port mainframe. Independent use of modules speeds up testing in Labs and customer sites.